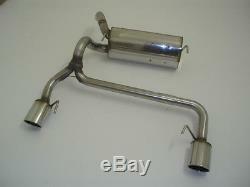 Nil Duplex Performance Exhaust VAUXHALL ASTRA J GTC Built 2011 1.4L Turbo. The description of this item has been automatically translated. Friedrich Motorsport duplex sport rear silencer from Stainless steel for Opel Astra J GTC! With tail pipe of your choice! : Article: Duplex sports muffler :: Tube diameter: 63,5 mm :: Material: stainless steel :: Certificates: EC type-approval (free registration). Opel Astra J GTC from year 2011 1.4 l Turbo 88/103kW / 1.6 l Sidi Turbo 125kW / 1.6 l Turbo 132kW Please specify when ordering whether sports rear or OPC Line Package rear bumper has to be processed on the right side also suitable for the BiTurbo Heck, please specify when ordering. More exhaust solutions can be found in our. Whatever tailpipe choose, the price is always the same! Please note that the article on the basis of individual tailpipe design will be completed only after customers order! Depending on the current volume of orders, production usually takes weeks 1-2. In exceptional cases, it can take longer sometimes - you are then informed immediately. The item "Nil Duplex Performance Exhaust VAUXHALL ASTRA J GTC Built 2011 1.4L Turbo" is in sale since Monday, June 18, 2018. This item is in the category "Vehicle Parts & Accessories\Car Tuning & Styling\Performance Exhaust\Other Performance Exhausts".